If our parents have tortoise anything, it's that we shouldn't talk to strangers. 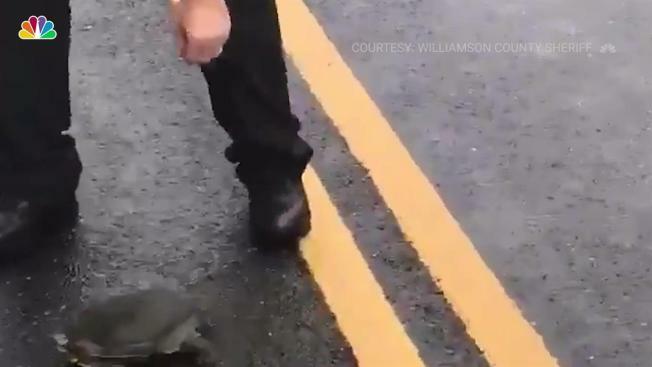 So when this turtle was approached by an officer on the road, he showed him he was in no need of offi-shell assistance. The turtle was found appearing motionless in the middle of the road in Williamson County, Texas. But as an officer approached the turtle, offering help, the turtle turned around and quickly scuttled off across the road. The Williamson County Sheriff posted the hilarious video online and said in his caption, “I was trying to help this little guy out. I don't think he appreciated my efforts. My heroic act for the day”. Watch the snub in the video above.